How do you get kids to sing praise and worship songs the very first time, especially if it's a new song, or they're too young to read the lyrics? Have them echo you! 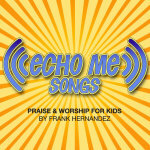 Here is a new collection of praise and worship songs written for elementary and preschool-age kids.